Photo courtesy Sandra Fox, click to enlarge. Edmund D. Mitton wrote out in his own hand a genealogy of who and where the Mittons had come from in England. It is a revealing “primary document” that ties Edmund D. Mitton to the family roots in the Craven area of England and “Squire” Joseph Mitton (1723-92). We can then link the family genealogy from ‘Squire Joseph’ buried at Horton-in-Ribblesdale back to “Ralph the Red” of “Mitune” in the Doomsday Book location of what is now Great Mitton. 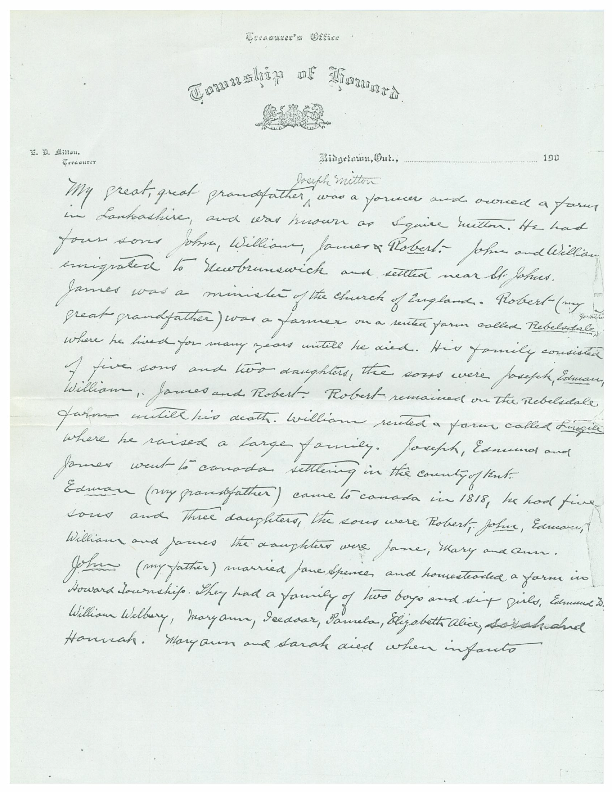 Below is a reproduction of a handwritten memo of Edmund D. Mitton of Ridgetown, Ontario aka. “Eddie the clerk”. The underlined names denote the father to son lineage and this is how Edmund identified the male father to son line back to “Squire Joseph Mitton” his great, great, great grandfather. The actual handwritten document is reproduced below and under the Documentation and Addenda drop down of this website. You may double click twice for a magnified view of this primary document from 1906. My great, great grandfather Joseph Mitton was a farmer and owned a farm in Lankashire and was known as Squire Mitton. He had four sons, John, William, James & Robert. John and William emigrated to Newbrundwick and settled near St. Johns. James was a minister of the Church of England. Robert (my great, grandfather) was a farmer on a rented farm called Ribelsdale where he lived for many years until he died. His family consisted of five sons and two daughters, the sons were Joseph, Edmund, William, James and Robert. Robert remained on the Ribelsdale farm until his death. William rented a farm called Lycile where he raised a large family. Joseph, Edmund and James went to Canada settling in the county of Kent. Edmund (my grandfather) came to Canada in 1818, he had five sons and three daughters. The sons were Robert, John, Edmund, William and James. The daughters were Jane, Mary and Ann. John (my father) married Jane Spence and homesteaded a farm in Howard Township. They had a family of two boys and six girls, Edmund, William Welbury, Mary Ann, Icedoor, Pamela, Elizabeth Alice, Sara and Hanna. Mary Ann and Sara died when infants. Lloyd Mitton`s Ontario-New Brunswick genealogy notes and details of the children of the axiom ancestor, “Squire” Joseph Mitton, 1723-92. “Joseph Mitton known as Squire, Lancashire was born in 1723. He married Mary Wilkinson who was born in1728. Joseph and Mary had four children, John, William, James and Robert. John and William emigrated to New Brunswick residing near Saint John. James became a parson of the church of England. Robert Mitton was born on November 4,1759 at Hubberholme, Yorkshire. On September 2, 1782, he married Jane Blenkhorn. Jane was born on October 23,1756. Robert and Jane had five sons and five daughters. At least five of their family came to Kent County as pioneers. In Robert’s will Edmund is referred to as Edward. He and brother James were to receive 80 pounds each. *Paraphrase of Sec. of War Stanton’s comment upon President Lincoln’s death. The handwritten genealogy document of Edmund Mitton tracing the family line back to “Squire Joseph” 1723-92 of Starbotton in the Craven area allows us to connect the Knowles 1982 genelogy and the 14th century Coucher book of Whalley abbey genealogies with those and other additional research to “Ralph the Red”. The following is the Ontario line from Edmund D. Mitton proceeding back each generation, father to father to Roger Mitton br. circa 1530, d. 1585 of Austwick, Yorkshire. According to the genealogist Jack Knowles this is an authenticated genealogy based on the “Bishops Rolls” of the local deanery. 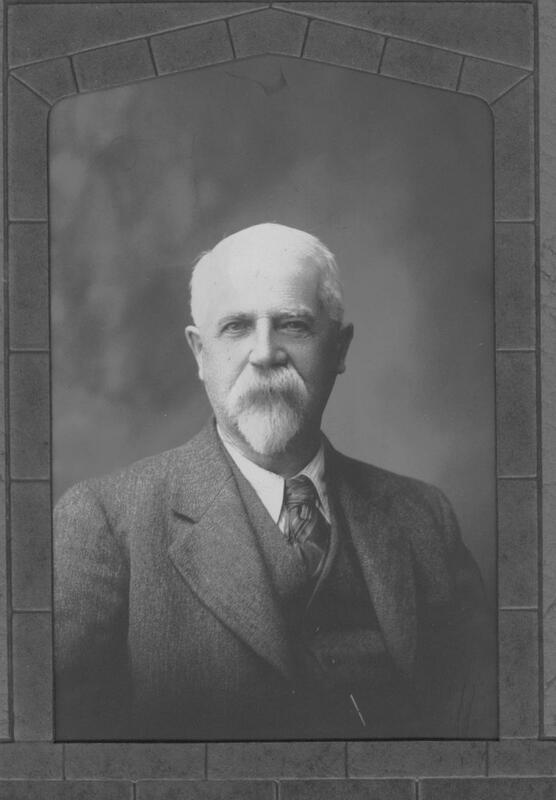 Edmund D. Mitton (pg. 56 1906 memo) br. 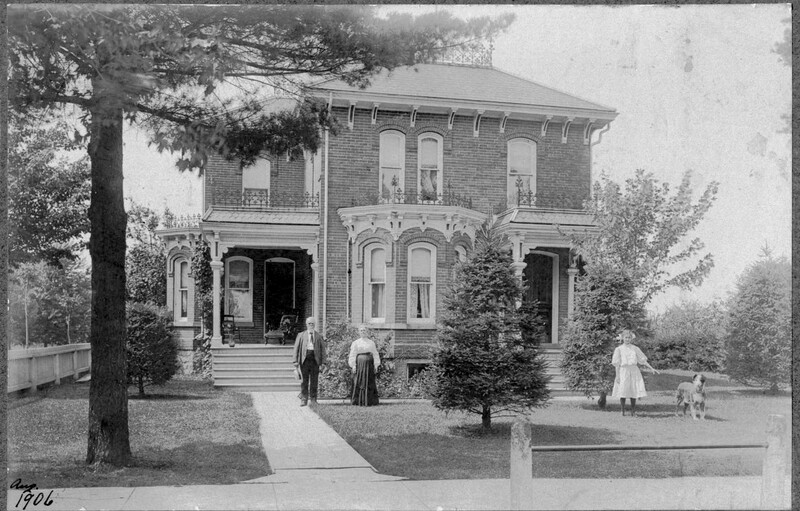 1847 d. 1930 Ridgetown, Ont. (the authors great, grandfather) m. Kalista Kitchen, father of Rowland, Urville (my grandfather), siblings Cecil and Hazel all of Ridgetown, Ont. Urville sons were Eugene, Manley br. Aug. 11,1908 d. June 30, 2005 (author Bruce`s father) and Edmund Francis the youngest son of Urville. John or “Grover John” of Ridgetown, Ont. br. June 1818 Yorkshire, England m. Jane Spence. Carried by his parents to Ridgetown in 1818 as an infant. Edmund 1788 bpt. Horton. m. Mary Stott. Emigrated to Kent County Canada with youngest son John (above). Other children were Jane 1810, Ann 1812, Robert 1814, Mary 1816. Robert br. 1759 died June 1833 at Topps (Horton). His children were Mary, Joseph, Ann, Edmund (above) William, James, Elizabeth, Robert, Nancy & Jane. “Squire” Joseph Mitton was born in Starbotton in 1723 his father’s residence. Buried Nov. 25, 1792 in Horton-in-Ribblesdale, Yorkshire England. Robert Mitton of Starbotton. Only son. 1695-1784, m. Elizabeth. Robert’s father was another Joseph Mitton (not “Squire” but his grandfather) from Starbotton, born Oct. 14,1661 died June 29, 1742. Buried at Kettlewell. Robert born in Austwick in 1629 and was a blacksmith living in Starbotton in the Parish of Kettlewell. He died in 1686 and is buried at Kettlewell. Roger Mitton br. 1603 died 1685 of Austwick, Yorkshire. M. Margaret Halton. Richard of Austwick, Yorkshire m. Elizabeth born 1577, died 1620. Roger Mitton of Austwick br. 1530, d. 1585. Supposed father of Richard above. Roger married Elizabeth. Roger married Janet Lockwood and had 2 children. He passed away 1585 at Elland, Yorkshire, England. Editor’s note: The Jack Knowles genealogy has a Roger died 1585 right after Richard was born in 1577 and claims him not only as Richard’s father but a descendant of one of the early Norman de Mittons. The same with the 1974 genealogy by Daniel Sommerfeldt of York, British Columbia. Richard was undoubtedly related in some way but his direct pedigree to the Norman Mittons is unknown. The “Bishops Rolls” started right about these dates (1538) and previous church records were not common. The exceptions are the Whalley Abbey records of the Norman de Mittons of the 12th to 14th century, recorded and transcribed from the Latin in the Coucher Book of Whalley. Those “unconnected ” late 14th-16 century Mittons: I have provided the previous genealogy that traces one extended Mitton family of the Ontario-US line back to the Craven area of Yorkshire prior to immigrations. Other Mittons will have to make their own extended family connections to the axiom Ribblesdale ancestor “Squire” Joseph Mitton” (1723-92). The geographic Yorkshire locations of the 16th to 19th century Craven Mittons is within a few miles of Great Mitton. 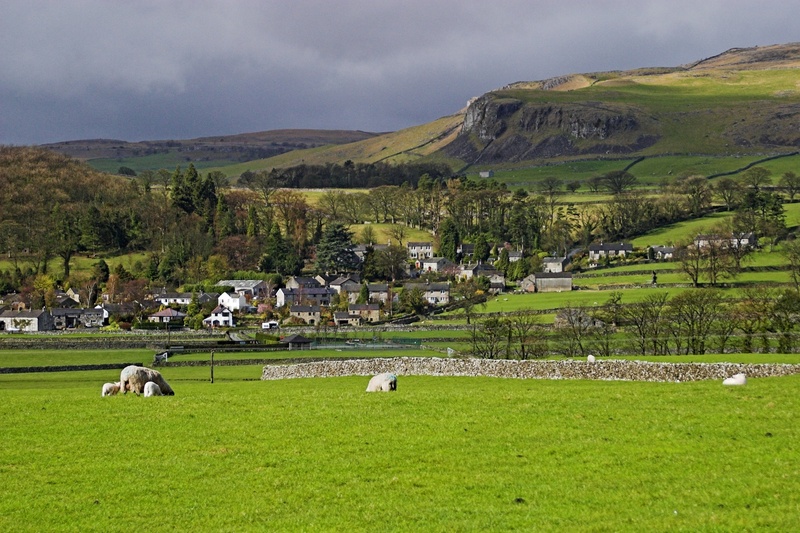 Horton-in-Ribblesdale near “Squire” Joseph Mitton’s farm is only 22 miles north of Great Mitton. That close geographic proximity minimizes doubt of them being of the same family legacy. The Mittons lived in the same Clitheroe/Craven neighborhood for 700 years. Most seem to be born, baptized, married and buried in the Craven area of Yorkshire for centuries. The Norman line from the 12th century to the end of the 14th century. The Canadian/US lines 19th through to the 21th century. Austwick near Horton-in-Ribblesdale, Yorkshire, England, where many Mittons lived.